COMM 3201 “Introduction to Electronic Media Production” is an introductory course at the University of Minnesota that enhances students’ media literacy by combining theoretical knowledge of aesthetic composition principles in television and film with applied media production skills in a multi-camera studio. In the Fall of 2014, students in my COMM 3201 section were asked to do something a little different: for their final project students had to write and produce their own public service announcement engaging a social justice issue. 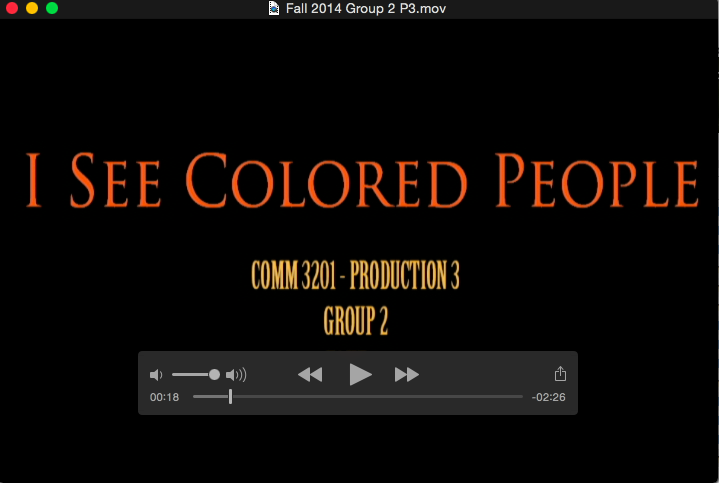 Class discussions about racialized media representations and the nationwide #BlackLivesMatter protests spurred an interest in Samantha Cabrera, a graduating senior majoring in Communication Studies, to craft a script titled “I see Colored People.” Drawing on her own experiences as an immigrant student of color at the University of Minnesota, the PSA reveals the functions of “white privilege” and asks viewers to be conscious of race in U.S. society.